Measles is a very contagious disease that is caused by an RNA virus, known as a paramyxovirus. The virus can stay alive for up to two hours in the air. Incubation of the disease is from 1 to 2 weeks but symptoms can last for up to 10 days. It is most contagious during the early symptoms (prodromal stage) of the disease and the person remains contagious for quite some time. About 90% of people exposed will become ill with the measles. People are infected when they come into contact with droplets produced by sick people who are coughing or sneezing. Conjunctivitis, which is an infection of the outer membrane of the eye; typically eyes are red and watering. Photophobia, that is, the eyes are physically sensitive to the light. Enanthem present (i.e. a rash that is located on the membranes that produce mucus). Koplik spots (small rash) on the epithelial membrane that lines the inside of the mouth. Maculopapular rash occurs (a flat red area that has small bumps). This rash spreads from the head downwards to the extremities. Bruising ranging from mild to more severe can occur with worse rashes. The Koplik spots in the mouth appear before the rash. The rash develops on about the fifth day of illness. The rash starts on the front of the face within about a day, and then spreads to the torso, abdomen and limbs. After about another 5 days the rash fades and the patient begins to recover. Measles can cause severe illness leading to brain swelling in some people and even blindness. Measles can even cause death due to such complications as pneumonia, and less often, encephalitis. Measles can be prevented if people are immunized. The measles, mumps, rubella (MMR) vaccine provides protection from the virus. Widespread vaccination has decreased the prevalence of measles in the population. Rubella is caused by a virus which also has RNA as its nucleic acid. Similar to measles, it can be transmitted by respiratory secretions, from people coughing or sneezing. People who are infected are contagious for up to a week before they show symptoms and for about two weeks after the symptoms develop. 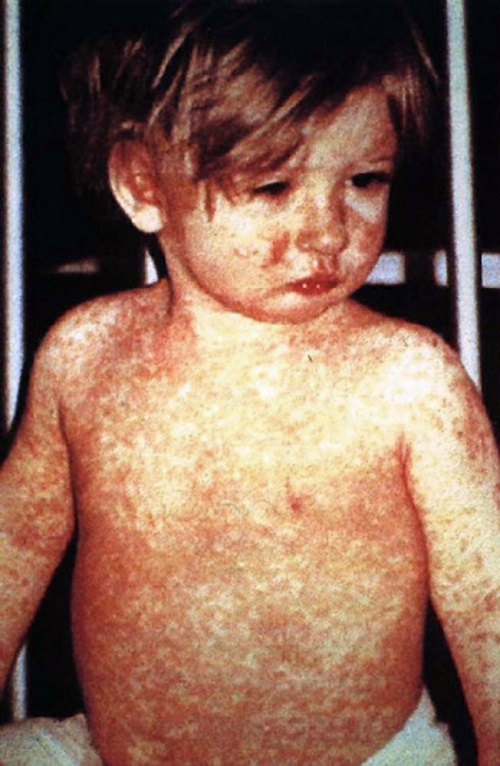 It is also known as German measles and is not as contagious as measles. Many people who are exposed to rubella do not become ill. It is also not a severe illness except in those with a compromised immune system. Incubation of the disease can take from about 2 to 3 weeks. Symptoms can include a low fever (less than 38.3o C), general feeling of discomfort, conjunctivitis and swollen lymph nodes. Painful joints can also occur in some people. Painful swollen lymph nodes in the neck are common and the back of the throat becomes reddish in color. No early symptoms (a prodromal stage), occurs in rubella. Rubella has some similar symptoms to measles in that there are a rash and a fever. A rash first forms on the face then spreads to the rest of the body. It does not last long and starts to fade to tiny spots by the second day, at which time the fever stops. The rash can last up to 5 days. Bruises that form on the soft palate of the mouth (known as Forschheimer spots), will join together to form a reddish area. Rubella in a pregnant woman is very dangerous and can cause defects in a newborn such as deafness, microcephaly and even stillbirths. It can even lead to cataracts and heart defects in the newborn if the mother is exposed during pregnancy. The best protection against rubella is the MMR vaccine. The incidence of rubella decreased after vaccination programs started. Measles is far more contagious and severe an illness than rubella. In measles there is a prodromal stage while there is no prodromal stage in Rubella. Incubation in measles is from 1 to 2 weeks, in rubella it is from 2 to 3 weeks. Symptoms of measles can last for up to 10 days, while symptoms of rubella usually last a maximum of 5 days. Swollen lymph nodes always occur with rubella but not often with measles. Koplik spots are a symptom in measles, while Forschheimer spots are a symptom in rubella. Photophobia occurs in measles, but does not occur in rubella. The measles rash consists of blotches which last a while, while the rubella rash consists of spots, which fades fast. Measles and rubella are both caused by an RNA virus and are spread through respiratory droplets produced by sick people. Measles is more severe and highly contagious compared with rubella. 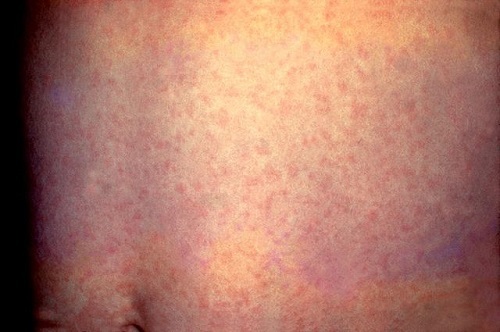 Although both measles and rubella have similar symptoms such as a rash, the rash is slightly different between the two. Measles rash and symptoms last longer than rubella. Rubella does not have a prodromal stage while measles does. Rubella causes a low fever and does not last long. The eyes are also not sensitive to light as they are in the case of measles. Measles and rubella can both cause problems for the fetus in a pregnant woman. A person can be vaccinated against both these two diseases with the MMR vaccine. Dr. Rae Osborn. "Difference between Measles and Rubella." DifferenceBetween.net. November 9, 2017 < http://www.differencebetween.net/science/health/difference-between-measles-and-rubella/ >.